2012 Aprilia MXV 4.5. Picture credits - Aprilia. Submit more pictures. The dimensions of the perimeter frame have been optimised for motocross use, and the entire frame has been developed to complement the engine. Its design is unique among motocross frames. A tubular steel trellis is interference fitted to pressed aluminium side plates to form a single structure. The engine also forms an integral part of the chassis, acting as a load-bearing element and contributing to exceptional overall rigidity. Engine details: Rocker operated exhaust valves, chain timing drive, 4 valve heads, titanium valves. Driveline: Primary drive: Spur gears. Transmission ratio: 23/65. Final drive: Chain. Transmission ratio: 14/49. Front brakes: Single disc. Lightweight stainless steel floating disc with Nissin floating caliper. Wheels: Black anodised aluminium alloy. Ask questions Join the 12 Aprilia MXV 4.5 discussion group or the general Aprilia discussion group. 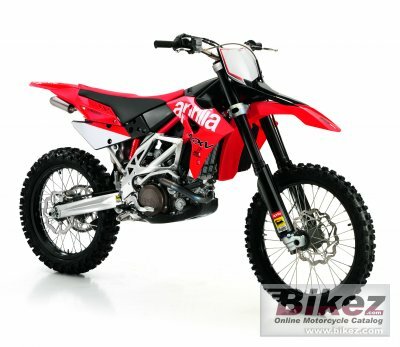 Click here to sell a used 2012 Aprilia MXV 4.5 or advertise any other MC for sale. You can list all available Aprilia MXV 4.5 bikes and also sign up for e-mail notification when such motorcycles are advertised in the future. Ads with or without pictures are easy to create. Our classifieds are completely free with sections for every country in the world. You can also check out our list of related motorbikes. Compare technical data. Look at photos. View your fellow riders' rating of the bike's reliability, design, engine performance, accident risk, repair cost, etc.